The Princessa de Penasco is a beach front resort with many wonderful amenities. The resort was designed to emulate the shape of an arc. The arc is made up of five yellow towers that have a beautiful Old World Mexican courtyard in the center. The courtyard has several red brick walkways with flower lined grassy areas shaded by palm trees. The resort has premium amenities like 3 swimming pools, a Jacuzzi spa, and palm frond umbrellas above lounge chairs in the sand. The resort also includes a sand volleyball court where you can challenge your neighbors to a game and an ocean view fitness center that has everything you need to stay in shape. The resort also includes an on-site cantina called Agave. Agave has wonderful daily food and drink specials. This is a very safe resort with 24 hour on-site security. This is a 3 bedroom condo on the 5th floor of the A Tower. 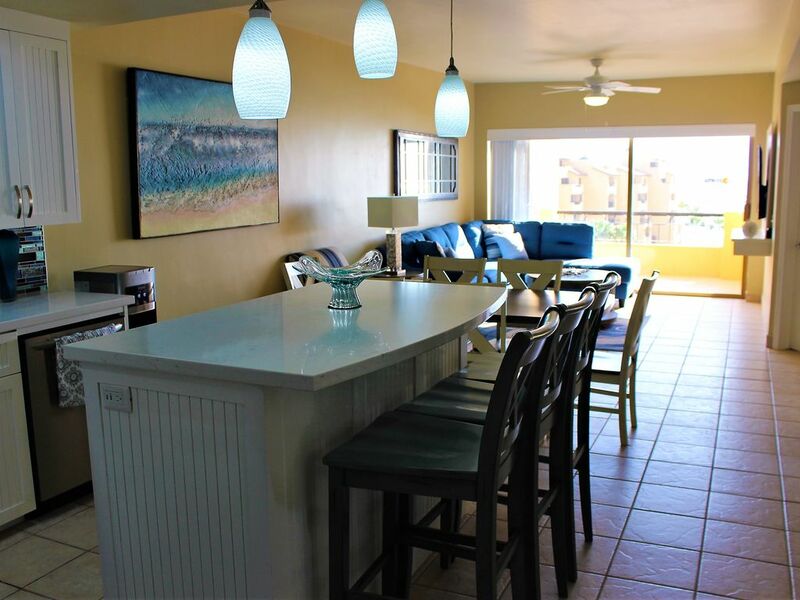 This condo is located ocean front with accommodations for 8 people. In the living room the walls are all painted a rich red color with one dark black leather sofa and a bright red suede arm chair. The room has a wall mounted bronze picture and a glass and wood trimmed coffee table. The wall opposite the sofa has a large oak wood entertainment center that has a TV, DVD, VCR, and stereo system. You will be happy to know you can communicate via email and surf the web on the high speed wireless internet network. You can get to the terrace through the arcadia door in the living area. In the dining room there is an oval shaped distressed wood table with 6 chairs in red, yellow and blue. Above the wall in the dining room there is a wall mounted wood framed mirror that gives the illusion that the room is much bigger. A frosted pendant lamp is hung above the table to illuminate the area. The kitchen has royal blue painted walls with distressed wood cabinets that have royal blue painted trim. The kitchen has a built in bar made of white ceramic tile with purple yellow and blue bar stools beneath it. The appliances are black and the kitchen has everything to make you feel like you are cooking in your own home kitchen. The master bedroom has one wall painted bright magenta and the other painted royal blue. The room has a large king size bed with a canopy and pink striped bedding. The room has a matching wood night stand with a lamp and a double door armoire with a TV and drawers for clothing below. The room has a gold framed wall mounted mirror, silk plants and two arcadia doors that provide access to the terrace. The attached master bathroom is painted bright peach and it has two sinks with a large mirrored marble vanity, tub, shower and commode. The 2nd bedroom is painted mauve with a white metal framed queen size bed and tan silky bedding. The room has two maple wood bed tables both with white ceramic lamps and a dresser with a TV. The room also has a large double mirrored door closet. The 3rd bedroom has royal blue walls with 2 sets of twin size bunk beds with baby blue bedding. The room has a large double door mirrored closet and a dresser with a TV. The hall bathroom is also painted blue with a striped shower curtain, tub and shower. The terrace has many different seating options and is definitely made for entertaining. The terrace would be the perfect spot to kick back and relax with a cold beer or frozen margarita while you feel the warm ocean air kiss your skin. You should definitely dine outside in the evenings so that you can witness the world's most beautiful sunsets. The condo comes with a washer, dryer and ceiling fans throughout. You will be elated with the amenities and experience you have in this condo inside the Princessa de Penasco! Book Your trip to paradise now! 10 of us shared this condo for a week over spring break, was everything we expected and more. The description of the condo really under sells the place, it has been repainted since the pictures were taken and has all neutral colors throughout. The master bedroom and bathroom are actually located on the second floor of the condo and has its own balcony. The condo was immaculate when we got there and had everything we needed. The condo does not have a stereo like I believe the listing indicated, but that was not a big deal. The condo is literally steps from the beach and the grounds are excellently maintained. 10/10 would stay here next year if same owners retain the property.